You were right, the goalkeeper was easy but what about the full backs? Well left and right back has become a real struggle in recent years with such luminaries as Jonathan Spector (blimey and we thought he was pony), Djimi Traoré, Greg Halford, Danny Butterfield and Martin Cranie all playing there at some point. Only this season do we finally looked to have found a couple of reputable owners of the full back berths. Simply we were spoilt in the early part of the decade. Right back at the turn of the century was never nailed down with Greg Shields, Steve Brown, Andy Todd, Mark Fish, Radostin Kishishev and Jon Fortune all filling in until we signed Luke Young from Spurs in the summer of 2001. It was one of the early signs of the big time for Charlton, because Young had a big reputation at White Hart Lane and I remember well Spurs fans I used to work with being dismayed at the £4m sale of the then 21-year old. However his early years at The Valley were not particularly good. I personally never took to him and around me in the East Stand he was commonly known as Lukewarm. It was fully two seasons before he started to become more appreciated and after shaking off some injury problems Young became a mainstay in our defence and the 2005 Player of the Year and I was proud to be at his England debut in Chicago in May of the same year. He was another who fell out with Alan Curbishley but after he left Young stayed until we got relegated. Despite Pardew's penchant for a loanee right back unless I choose Steve Brown, and I could practically pick him for every position including goalkeeper, I have a very shortlist of one for right back of the decade. 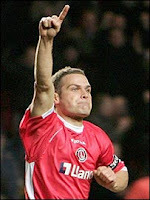 The Herminator was the relegation expert when he came to The Valley in March 2003 for £900,000 (he had to wait until August for his debut) but aside from his Palace background I had always been an admirer. The Icelandic played with his heart on his sleeve and made the left back position his own but often fitted in at centre-half. It appeared he had learnt his lesson from his previous employers though and had a clause inserted in his contract that he would be allowed to leave Charlton on a free transfer if we got relegated and he moved onto Pompey. Paul Konchesky became the youngest player to appear for Charlton (a record broken by Jonjo Shelvey) when he played against Oxford United in August 1997 at the age of 16 years and 93 days but it was only at the beginning of this century that he started to become a regular feature in the side at left back but his opportunities were always sporadic and Curbs often played Konchesky on the left side of midfield much to the Dagenham boy's chagrin. You may see a trend forming here but he too fell out with Curbs and moved on loan to Spurs in the days when we used to give them our cast offs only to come back and claim a regular place in the 2003/4 season. In the week after his return he came on as a sub (as a left midfielder) in the 4-2 Boxing Day victory over Chelsea and then played right back in the 1-0 win back at White Hart Lane two days later. Konchesky could never supplant Hreiðarsson though and eventually moved onto his boyhood club West Ham in the summer of 2005 for £1.5m. Sir Chris Powe ll also has Crystal Palace on his resume but he well and truly learnt the errors of his way. Loved at Derby County he was signed by Curbs in the summer of 1998 after we won the play-off final for £800,000. He was instrumental in helping us get back to the Premiership and then after well over 400 career games got picked by Sven-Göran Eriksson for the England friendly against Spain in December 2001. We all felt so proud. 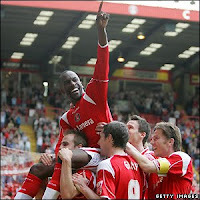 There have been few players so loved down the years by Charlton fans. His trademark leap from the tunnel after games was always worth getting caught in traffic for. He left twice but both times came back home and his last season with us played 19 games under Pardew and memorably scored only his 3rd goal for us in his last game at home to Coventry. Chrissy Powell is a Charlton legend and I've bored you about this before, but I once spent a 10-day holiday in his company and he is possibly the nicest bloke you've ever met too and to this day the reception he got at Pride Park on his return with us is one of best I have ever seen an opposition player get. He is still registered as a player for Leicester and has made two appearances this season but is primarily employed as first team coach. A future Charlton manager? I hope so.